Overnatning på stille kompleks med pool udsigt, Gratis WiFi & Uk Tv. Denne lyse og luftige toværelses lejlighed ligger på et kompleks, der blev fuldstændig renoveret og solgt til privat eje i foråret 2008. Ældre kanariske haver i hele komplekset tonen an i et afslappet miljø. Med en stor swimmingpool i fri form, separat pool og liggestole, tilbyder komplekset også et gym for mere aktive gæster! Las Dunas Residencial ligger i en rolig del af byen nær de berømte beskyttet Sand klitter gør det ideelt for dem, søger en afslappende pause og vandsport entusiaster ens. Fuldt flisebelagt badeværelse med badekar og bruser over, toilet, bidet, håndvask og spejl. Der er en stikkontakt i her for en barbermaskine eller hårtørrer. The apartment was a comfortable stay. Located in a very good position within easy walking distance to the beach and main shops and restaurants,also a very good selection available to choose from. Colin who looked after any requirements during our month stay was very helpful.We would like to say a special thanks to Jean and Gordon next door for all the help they gave us in finding our way around.Wonderful couple.Our break was really enjoyable.The only gripe i have is that UK tv. was advertised but it was not watchable as it was always breaking down.. This apartment had everything you would need, for your stay, it was spotless. Colin was very helpful while we were at the apartment nothing was too much trouble. Neil the owner was great with all the information we needed for our stay, would like to thank them both, we would definitely love to return here. We stayed at Las Dunas for 3 weeks during September and had a thoroughly lovely holiday. The complex itself is stunning, with a beautiful pool and very attractive tropical planting. Some of the flora is quite stunning. Everywhere is spotlessly clean and the vibe is very European and low key. Many different nationalities create a very pleasant atmosphere. No lager louts here! 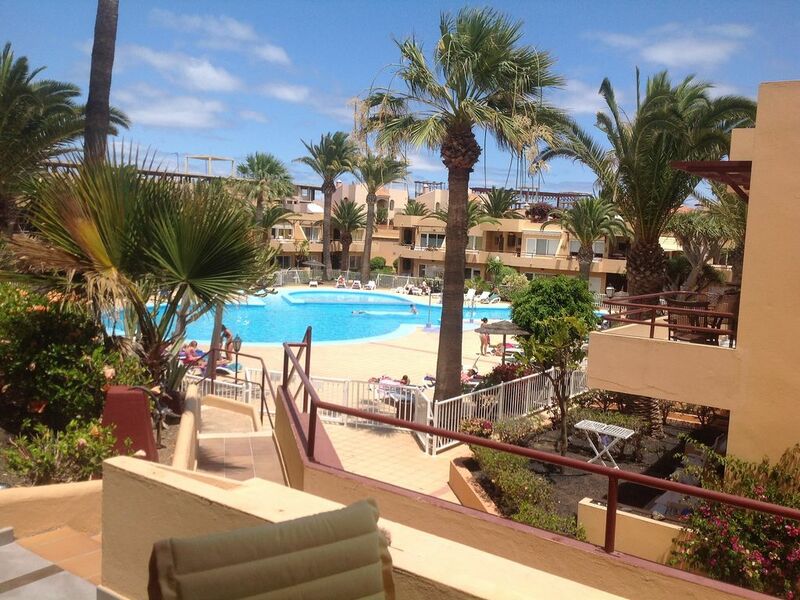 The apartment has a lovely aspect with great views over the pool. Although it is quite small, we found it to be comfortable and well equipped and overall very good value for the price we paid. The surrounding area (close to the edge of the dunes) is peaceful and very flat, which was great for my dodgy knees. There is an excellent commercial centre a 5 min walk away The Campinaria (belltower). Handy for groceries and mooching. Nice bars and restaurants and local music's played in the square for you to enjoy. Corralejo harbour with its boat trips and watersports is a short stroll or taxi ride away. We loved going out on all the trips to local islands and beaches whenever you fancy. The local style restaurant/bar down by the harbour is a winner in terms of atmosphere (a big blue building) we often sat there before and after trips out watching the world go by! The property is lovely and very well equipped. The pool area is beautifully landscaped. BUENA UBICACIÓN Y BIEN EQUIPADO. GOOD LOCATION AND WELL EQUIPPED. Øen er perfekt egnet til vandsport og vind entusiaster, vært for en international dragefestival ud på 'flag' strand, med talrige surfing, windsurfing, kitesurfing muligheder! Havfiskeri og bådture er tilgængelige fra havnen. Nærmeste strand ligger kun 350 m fra komplekset og er beliggende foran Bahia Virkelige 5 stjernet kompleks. Fredelig og læ, ideelle sted til at nyde solen. Den beskyttede 20 kvadrat km område klitterne og "flag strand" starte en 5 minutters gang fra komplekset, eller en 10 minutters gåtur i den anden retning tager dig til kanten af ​​de vigtigste byens strande. Waikiki beach tilbyder windsurfing, mens 'Town' strand er perfekt til små børn til at forsøge at fange Baby havnen multe med fiskenet. Lufthavnen er en 30 minutters kørsel fra komplekset. Færgen over til Lanzarote kører 8 gange om dagen. Hvis du har brug for at tage en taxa tilbage til lejligheden fra byen, dette koster omkring 3 euro. Ud over at være blot 350 m fra stranden, komplekset er 3 minutter fra det nærmeste supermarked, 5 minutter fra El Campinario indkøbscenter, 10 minutter fra Baku vandland og 15 minutter til hjertet af Corralejo. Booking Notes: Current terms and conditions, including details of deposits, etc can be found on our website (link below). Changeover Day: Changeover days are flexible. Unless by prior arrangement, the apartment will be made available from 2pm on the day of arrival and must be vacated by 11am on the departure date. Notes on prices: All periods per week. Prices quoted are for the apartment per week in UK pounds.